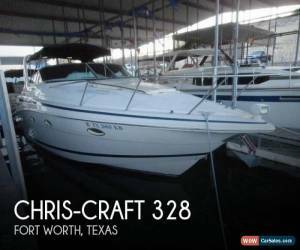 If you are in the market for cruiser, look no further than this 2003 Chris-Craft 328, just reduced to $62,500 (offers encouraged). 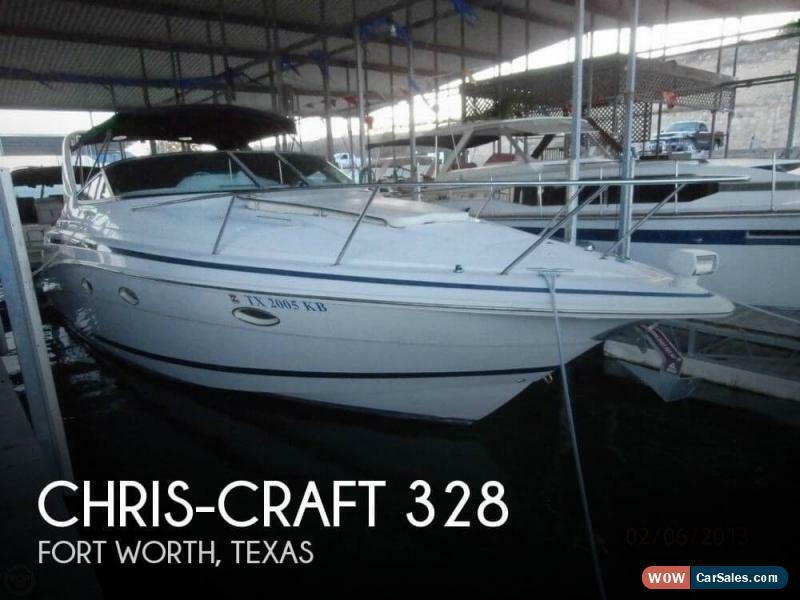 This vessel is located in Fort Worth, Texas and is in good condition. 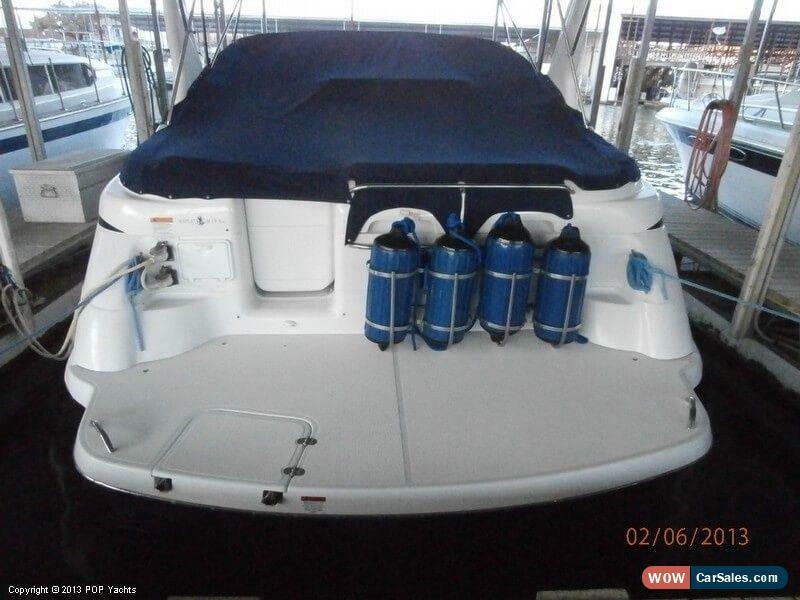 She is also equipped with twin Volvo Penta engines that have only 157 hours. Please submit any and ALL offers your offer may be accepted! Submit your offer today! 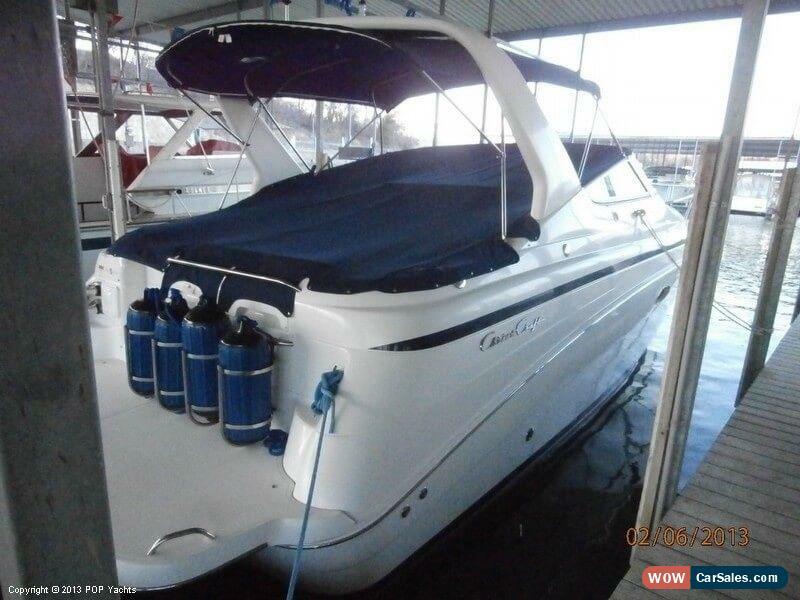 Take look at ALL ***125 PICTURES*** of this vessel on our main website at 2003 Chris-Craft 328. We appreciate that you took your time to look at our advertisement and we look forward to speaking with you! Options and Standard Features	Options		A/C: Included		Bath: Included		Berth: Included		Cabinets: Cherry		Cockpit Shower: Included		Curtains: Included		Dinette: Included		Drink Holders: Included		Flooring: Snap Out Carpet, Non Skid		Freezer: Included		Fridge: Included		Galley: Included		Handbasin: Included		Head: Included		Hot Water System: Included		Icemaker: Deck		Pressurized Water: Included		Pressurized Water System: Included		Sink: Included		Table: Included		: AccommodationsCOCKPIT: Extended Swim Platform With Concealed Ladder, Transom Door, Transom Shower, Power Assisted Engine Hatch, U-Shaped Cockpit Lounge Seating With Cockpit Table, Cockpit Wet Bar With Molded Sink, Faucet And Ice Maker, Double Wide Helm Seat And Companion Seat With Unique Walk Thro		Carpet: Snapout		Heat: Included		Flat Screen TV: Included		Gel Coat: Included		Radar Arch: Included		Vent System: Included		Power Engine Hatch: Included		Thru-Hull Fittings: Included		Additional Cockpit Settee: Included		Aft Deck Sun Pad: Included		Bimini: Included		Cockpit Carpet: Included		Cockpit Cover: Included		Dive Platform W/Ladder: Included		Eisenglass: Included		Foredeck Sun Pad: Included		Mooring Lines: Included		Non-Skid Deck: Included		Steering Wheel Trim: Included		Thru-Bolted SS Cleats: Included		Transom Door: Included		Transom Seating: Included		Transom Shower: Included		Pop-Up Cleats: Included		Rub Rails: Included		Sun Awning: Included		Swim Ladder: Included		Windshield: Included		Windshield Wipers: Included		Wrap Around Eisenglass: Included		: DeckExtended Swim Platform W/ Concealed LadderTransom DoorTransom ShowerRadar Arch With Overhead LightsBimini Top And Full Eisenglass EnclosureU-Shaped Cockpit Lounge Seating W/ Cockpit TableWet Bar W/ Sink And Ice MakerDrink HoldersMolded Steps To Walk-Thru WindshieldRemovable I		Beverage Holders: Included		Camper Canvas W/Screens: Included		Canvas: Included		Cockpit Faucet: Included		Cockpit Lighting: Included		Cockpit Seating: Included		Cockpit Sink: Included		Cockpit Table: Included		Cockpit Wet Bar: Included		Cooler: 2		Courtesy Lights: Included		Fender Holders: Included		Lines: Included		Swim Platform: Included		Washdown: Included		110V AC Outlets: Included		12 DC Outlets: Included		4 Switch Circuit Breaker: Included		ABYC Color Coded Wiring: Included		AC Electric Panel: Included		Accessory Switches: Included		Alternator: Included		Battery: Included		Battery Location: Included		Battery Switch: Included		Generator: Included		Horn: Included		Ship's Power (12V DC): Included		Shore Power: Included		Shore Power Cords: Included		Stereo: Included		Water Heater: Included		Engine Kill Switch: Included		Gauges: Included		Electric Engine Hatch: Included		Bilge Blower: Included		Cooling System: Included		Engine Alarms: Included		Engine Cylinders: 8		Engine Location: Aft Under Deck		Fiberglass Stringers: Included		Hand Rails: Included		Trim Tabs: Included		Windlass: Included		: SPECIFICATIONSOverall Length W/Platform: 34'10" 10.6 M.Beam: 11'10" 3.61M.Dry Weight: 12,000 Lbs. 5,443 Kg.Fuel Capacity: 210 Gallons 795 L.Deadrise: 20 Deg.Draft Drive Up: 26" 66 Cm.Draft Drive Down: 39" 99 Cm.Water Capacity: 41 Gallons 155 L.Holding Tank: 35 Gallons 132 L.		Fuel Tank Location: Midship Under Deck		Propulsion: I/O		Arch: Included		Compass: Included		Depth Instrument: Included		Fuel Gauge: Included		Fuel Management System: Included		Sound System: Included		Speed Instrument: Included		VHF: Included		Navigation Lights: Included		Spotlight: Included		Cockpit Tables: Included		Alarm: Included		Bilge Pump: Included		Bright Cockpit Lighting: Included		Carbon Monoxide Detector: Included		Dock Lines: Included		Fenders: Included		Gas Detector: Included		NMMA Certified: Included		Pfd's: Included		Searchlight: Included		Sump Pump: Included		Fire Extinguisher: Included		Fire Suppression System: Included		Throwable PFD: Included		: ElectronicsGarmin GPS MAP 182CLowrance Depth FinderDanforth CompassVHF RadioCustom Chris-Craft Gauge PackageIlluminated SwitchesMahogany Grain Dash PanelsTilt Steering13 In Toshiba Color TV/DVDClarion AM/FM Stereo CD W/ Speakers	Basic Information	Year: 2003	Make: Chris-Craft	Model: 328	Stock Number: 22859	Condition: Used	Type: Cruiser (Power)	Use: Not Specified	Length Beam	Beam (Feet): 11	Length (Feet): 32	Hull Type	Hull Material: Fiberglass	Engine	Fuel Type: Gasoline	Engine Make: Volvo Penta	Engine Model: 5.7 GXI	Engine Hours: 157	Fuel Capacity	Fuel Capacity (Gallons): Over 200	Exterior	Color: White/navy	Convenience	Water Hold (Gallons): 41		Similar Vehicles	Check out similar vehicles in our inventory. View Inventory	Contact	Ask for:Sales Department	Contact:	Contact Us	Main:(941) 803-7098	Showroom Terms	We make every effort to present information that is accurate. However, it is based on data provided by the vehicle manufacturer and/or other sources and therefore exact configuration, color, specifications accessories should be used as guide only and are not guaranteed. We are not liable for any inaccuracies, claims or losses of any nature. Inventory is subject to prior sale and prices are subject to change without notice and cannot be combined with any other offer(s). The price for listed vehicles as equipped does not include other charges such as: License, Title, Registration Fees, State or Local Taxes, Smog Fees, Credit Investigation, Optional Credit Insurance, Physical Damage of Liability Insurance, Delivery Fees, Finance and/or Documentation Fees. Any and all differences must be addressed prior to the sale of this vehicle. Selling Vehicle? Create Professional Listings Fast and Easy. Click Here! Copyright © 2017 Auction123 All rights reserved. Disclaimer	Auction123 (a service and listing/software company) and the Seller has done his/her best to disclose the equipment/condition of this vehicle/purchase. However, Auction123 disclaims any warranty as to the accuracy or to the working condition of the vehicle/equipment listed. The purchaser or prospective purchaser should verify with the Seller the accuracy of all the information listed within this ad.